The nose has light smoke, with hints of lavender. The mouthfeel is thin with no cling. 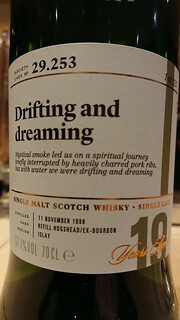 The body has lime, roast pork, cinnamon, cloves and crisp smoke - and a hint of chilli. The finish is crisp smoke with lime and cinnamon. Water brings out tight, thin whorling that expands quickly but dissipates without settling. The nose gains lemon, vanilla and apple. The body gains apple and some chilli. The finish gains lemon and chilli. Not a typical expression of this dram, with plenty of flavours - but will the fans like it? One for summer shorelines in the evening.